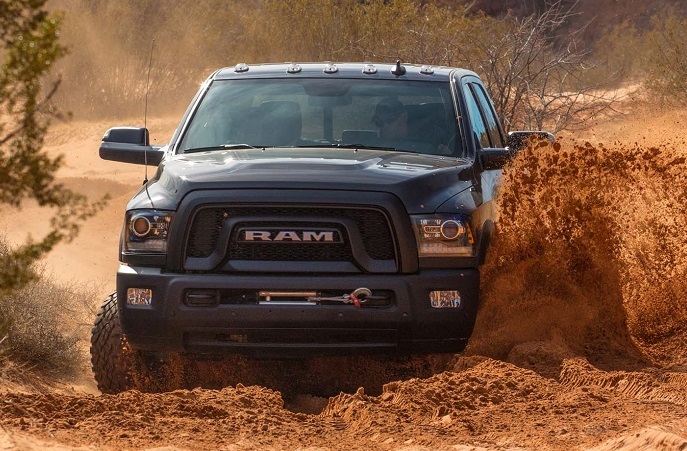 The 2018 Ram Power Wagon is engineered to spend most of the time on the challenging terrains and it is equipped for that job well. The Power Wagon starts from the Ram 2500 Crew Cab four-wheel drive version but it specialized as the off-roader and it comes with some pretty robust mechanics which can stand against any kind of terrain. The look of the model also speaks about its extreme off-road capability but you will also get everything you need inside the cabin. Styling wise, the 2018 Ram Power Wagon should be available in two flavors. When combined with Tradesman Crew Cab 4×4 trim, this model will focus to bring the most important, the off-road hardware but won’t matter much about the look. It will hide its off-road character behind the cross-hair grille, five-spoke chrome wheels, logos and flared fenders. However, if you are also visual type, the Power Wagon will also come with more extreme styling which matches its off-road capability. In this version, the unique grille like the one on the Ram 1500 Rebel will dominate up front combined with the blacked-out headlights. The grille surround, bumpers and fender flares will also feature black finish. This model will also augment its appearance with black decals on the hood, on the bottom of the doors and at the front section of the cargo bed. The smoked look of the LED taillights and Power Wagon lettering will define model’s tailgate. This version will also get unique 17-inch, 8-spoke wheels with the Goodyear all-terrain tires. Interior of the model will be spacious and model will get comfortable and supportive seats. A unique seat upholstery and other details will be Power Wagon-specific and model will also get brand’s latest infotainment system. The upgrades like the leather seats and other luxuries will also be available for the extra money. For its off-road role, the 2018 Ram Power Wagon will get pretty serious hardware but the engine is familiar. The power for the wheels provides the 6.4-liter V-8 engine delivering 410 hp and torque of 429 lb-ft. Nothing unusual is also the six-speed automatic gearbox. However, the things become different with model’s suspension. The standard three-link front suspension has got some special elements including the electronic sway bar disconnect system and Bilstein shocks. With that, this model has impressive 26 inches of the wheel travel. The rear suspension, on the other hand, features five-link, coil spring setup but also includes Bilstein shocks. The model also has 14.3 inches of the ground clearance while an approach angle is 33.6-degree, and departure angle is 26.2-degree. The model also possesses a two-speed BorgWarner transfer case. Add to that the front and rear electronic locking differentials and you can be sure that this model will be up to any challenge. If the unstoppable 7, 000 pounds 2018 Ram Power Wagon would be your choice be ready to pay around $53, 000 for its base form. With the available goodies, the price will climb over $60, 000.